After Studies in Musicology at the university of Copenhagen and bassoon at the Royal Academy of Music Bo Holten worked some years as music teacher and as critic at various newspapers in Copenhagen. He established the vocal group Ars Nova in 1979 with whom he since then made app 450 concerts; the works performed include almost 120 world premieres. Bo Holten and Ars Nova have recorded 15 CDs with both contemporary and early music. 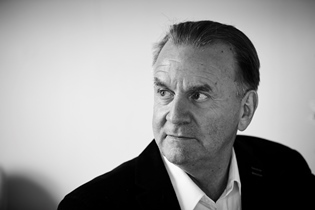 Apart from conducting Ars Nova Bo Holten has conducted most Danish professional symphony orchestras in both own and other composers' works and he was appointed Guest conductor of the BBC Singers of London in 1991. Recently Bo Holten and Ars Nova have parted and Holten has established a new outstanding vocal group, Musica Ficta, who already have proved to be a dominant factor in Danish musical life. Bo Holten has composed more than 100 works of which 2 symphonies, 5 solo concertos, several works for chorus and orchestra, 2 operas and 2 musicals deserve a mention. Furthermore a number of works for chamber ensemble, 3 song cycles and some pieces for percussion ensemble. Besides music to several films, TV-series, jingles etc. The works for chorus with or without instruments have a dominant position in his production. As composer and musician Bo Holten is thoroughly extrovert and it is important to him that the music is understandable and has an influence on people, and according to him musical composition is always an activity which is part of concrete musical practice. Bo Holten was a member of the State's Music Council 1979-83 and chairman of the music committee of the State's Arts Council 1990-93 and has received several distinguished awards including the Herman Sandby Prize 1980, Rostrum of Composers, Paris 1982, Danish Composers Association's Anniversary Grant 1983, The Art Council's Production Reward 1984 and the Mogens Wöldike Prize 1984.